Whenever one or more items change, Magento reindexes automatically. Any action such as price changes, creating catalog or shopping cart price rules, adding new categories, and so on can activate reindexing. Magento accumulates data into special tables using indexers to optimize performance. The indexed tables must be updated or reindexed when the data changed. Your store remains accessible during the reindexing background processes. Reindexing data boost speed of processing, and reduces the waiting time of the customer. For example, if you edit the price of a product from 4$ to 3$, Magento reindexes the data to display the price change in the store. Without indexing, Magento has to calculate the price of every product on the fly, taking into account shopping cart price rules, bundle pricing, discounts, tier pricing, and so on. Customers have to wait longer to see the product. Index Management has a slightly different presentation for flat product catalogs. To avoid problems when multiple Admin users update objects that trigger automatic reindexing, we recommend that you set all indexers to run on schedule as cron jobs. Otherwise, every time an object is saved, any objects with interdependencies might cause a deadlock. Symptoms of a deadlock include high CPU usage and MySQL errors. As a best practice, we recommend that you use scheduled indexing. Tick the checkbox to select indexer as you want, set action to Update on Save or Update by Schedule and click Submit to apply. 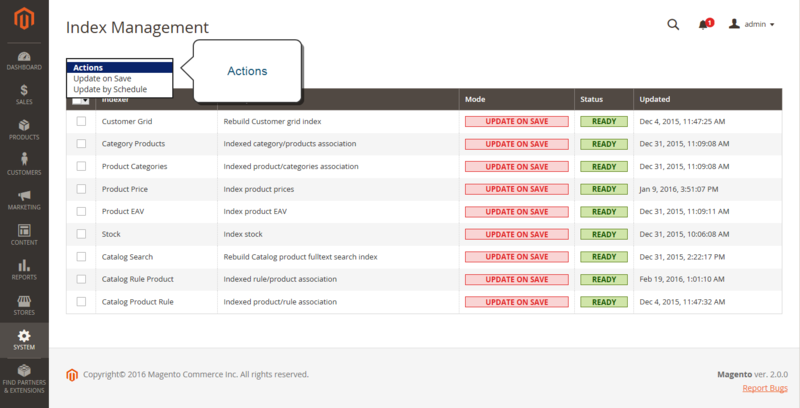 Above is a tutorial on how to configure index management in Magento 2 admin panel. We hope that you can optimize the loading progress of your website after reading this guideline. See you in the next article.